The Kafka Streams DSL (Domain Specific Language) is built on top of the Streams Processor API. It is the recommended for most users, especially beginners. Most data processing operations can be expressed in just a few lines of DSL code. Built-in abstractions for streams and tables in the form of KStream, KTable, and GlobalKTable. Having first-class support for streams and tables is crucial because, in practice, most use cases require not just either streams or databases/tables, but a combination of both. For example, if your use case is to create a customer 360-degree view that is updated in real-time, what your application will be doing is transforming many input streams of customer-related events into an output table that contains a continuously updated 360-degree view of your customers. Declarative, functional programming style with stateless transformations (e.g. map and filter) as well as stateful transformations such as aggregations (e.g. count and reduce), joins (e.g. leftJoin), and windowing (e.g. session windows). Specify one or more input streams that are read from Kafka topics. Compose transformations on these streams. Write the resulting output streams back to Kafka topics, or expose the processing results of your application directly to other applications through interactive queries (e.g., via a REST API). After the application is run, the defined processor topologies are continuously executed (i.e., the processing plan is put into action). A step-by-step guide for writing a stream processing application using the DSL is provided below. For a complete list of available API functionality, see also the Kafka Streams Javadocs. You can easily read data from Kafka topics into your application. The following operations are supported. In the case of a KStream, the local KStream instance of every application instance will be populated with data from only a subset of the partitions of the input topic. Collectively, across all application instances, all input topic partitions are read and processed. If you do not specify SerDes explicitly, the default SerDes from the configuration are used. You must specify SerDes explicitly if the key or value types of the records in the Kafka input topics do not match the configured default SerDes. For information about configuring default SerDes, available SerDes, and implementing your own custom SerDes see Data Types and Serialization. Several variants of stream exist, for example to specify a regex pattern for input topics to read from). You must provide a name for the table (more precisely, for the internal state store that backs the table). This is required for supporting interactive queries against the table. When a name is not provided the table will not queryable and an internal name will be provided for the state store. Several variants of table exist, for example to specify the auto.offset.reset policy to be used when reading from the input topic. In the case of a GlobalKTable, the local GlobalKTable instance of every application instance will be populated with data from only a subset of the partitions of the input topic. Collectively, across all application instances, all input topic partitions are read and processed. Several variants of globalTable exist to e.g. specify explicit SerDes. The KStream and KTable interfaces support a variety of transformation operations. Each of these operations can be translated into one or more connected processors into the underlying processor topology. Since KStream and KTable are strongly typed, all of these transformation operations are defined as generic functions where users could specify the input and output data types. Some others may generate a KTable object, for example an aggregation of a KStream also yields a KTable. This allows Kafka Streams to continuously update the computed value upon arrivals of late records after it has already been produced to the downstream transformation operators. All KTable transformation operations can only generate another KTable. However, the Kafka Streams DSL does provide a special function that converts a KTable representation into a KStream. All of these transformation methods can be chained together to compose a complex processor topology. Stateless transformations do not require state for processing and they do not require a state store associated with the stream processor. Kafka 0.11.0 and later allows you to materialize the result from a stateless KTable transformation. This allows the result to be queried through interactive queries. To materialize a KTable, each of the below stateless operations can be augmented with an optional queryableStoreName argument. Predicates are evaluated in order. A record is placed to one and only one output stream on the first match: if the n-th predicate evaluates to true, the record is placed to n-th stream. If no predicate matches, the the record is dropped. Branching is useful, for example, to route records to different downstream topics. Marks the stream for data re-partitioning: Applying a grouping or a join after flatMap will result in re-partitioning of the records. If possible use flatMapValues instead, which will not cause data re-partitioning. flatMapValues is preferable to flatMap because it will not cause data re-partitioning. However, you cannot modify the key or key type like flatMap does. You would use foreach to cause side effects based on the input data (similar to peek) and then stop further processing of the input data (unlike peek, which is not a terminal operation). Note on processing guarantees: Any side effects of an action (such as writing to external systems) are not trackable by Kafka, which means they will typically not benefit from Kafka’s processing guarantees. Grouping is a prerequisite for aggregating a stream or a table and ensures that data is properly partitioned (“keyed”) for subsequent operations. When to set explicit SerDes: Variants of groupByKey exist to override the configured default SerDes of your application, which you must do if the key and/or value types of the resulting KGroupedStream do not match the configured default SerDes. Grouping vs. Windowing: A related operation is windowing, which lets you control how to “sub-group” the grouped records of the same key into so-called windows for stateful operations such as windowed aggregations or windowed joins. Causes data re-partitioning if and only if the stream was marked for re-partitioning. groupByKey is preferable to groupBy because it re-partitions data only if the stream was already marked for re-partitioning. However, groupByKey does not allow you to modify the key or key type like groupBy does. When to set explicit SerDes: Variants of groupBy exist to override the configured default SerDes of your application, which you must do if the key and/or value types of the resulting KGroupedStream or KGroupedTable do not match the configured default SerDes. Always causes data re-partitioning: groupBy always causes data re-partitioning. If possible use groupByKey instead, which will re-partition data only if required. Marks the stream for data re-partitioning: Applying a grouping or a join after map will result in re-partitioning of the records. If possible use mapValues instead, which will not cause data re-partitioning. mapValues is preferable to map because it will not cause data re-partitioning. However, it does not allow you to modify the key or key type like map does. You would use peek to cause side effects based on the input data (similar to foreach) and continue processing the input data (unlike foreach, which is a terminal operation). peek returns the input stream as-is; if you need to modify the input stream, use map or mapValues instead. peek is helpful for use cases such as logging or tracking metrics or for debugging and troubleshooting. Calling selectKey(mapper) is the same as calling map((key, value) -> mapper(key, value), value). Marks the stream for data re-partitioning: Applying a grouping or a join after selectKey will result in re-partitioning of the records. Stateful transformations depend on state for processing inputs and producing outputs and require a state store associated with the stream processor. For example, in aggregating operations, a windowing state store is used to collect the latest aggregation results per window. In join operations, a windowing state store is used to collect all of the records received so far within the defined window boundary. Note, that state stores are fault-tolerant. In case of failure, Kafka Streams guarantees to fully restore all state stores prior to resuming the processing. See Fault Tolerance for further information. Stateful transformations in the DSL. Here is an example of a stateful application: the WordCount algorithm. // whatever may be stored in the record keys. After records are grouped by key via groupByKey or groupBy – and thus represented as either a KGroupedStream or a KGroupedTable, they can be aggregated via an operation such as reduce. Aggregations are key-based operations, which means that they always operate over records (notably record values) of the same key. You can perform aggregations on windowed or non-windowed data. To support fault tolerance and avoid undesirable behavior, the initializer and aggregator must be stateless. The aggregation results should be passed in the return value of the initializer and aggregator. Do not use class member variables because that data can potentially get lost in case of failure. When aggregating a grouped stream, you must provide an initializer (e.g., aggValue = 0) and an “adder” aggregator (e.g., aggValue + curValue). When aggregating a grouped table, you must provide a “subtractor” aggregator (think: aggValue - oldValue). Several variants of aggregate exist, see Javadocs for details. Input records with null keys are ignored. When a record key is received for the first time, the initializer is called (and called before the adder). Whenever a record with a non-null value is received, the adder is called. When a record key is received for the first time, the initializer is called (and called before the adder and subtractor). Note that, in contrast to KGroupedStream, over time the initializer may be called more than once for a key as a result of having received input tombstone records for that key (see below). When the first non-null value is received for a key (e.g., INSERT), then only the adder is called. When subsequent non-null values are received for a key (e.g., UPDATE), then (1) the subtractor is called with the old value as stored in the table and (2) the adder is called with the new value of the input record that was just received. The order of execution for the subtractor and adder is not defined. When a tombstone record – i.e. a record with a null value – is received for a key (e.g., DELETE), then only the subtractor is called. Note that, whenever the subtractor returns a null value itself, then the corresponding key is removed from the resulting KTable. If that happens, any next input record for that key will trigger the initializer again. See the example at the bottom of this section for a visualization of the aggregation semantics. You must provide an initializer (e.g., aggValue = 0), “adder” aggregator (e.g., aggValue + curValue), and a window. When windowing based on sessions, you must additionally provide a “session merger” aggregator (e.g., mergedAggValue = leftAggValue + rightAggValue). The windowed aggregate turns a KGroupedStream<K, V> into a windowed KTable<Windowed<K>, V>. The windowed aggregate behaves similar to the rolling aggregate described above. The additional twist is that the behavior applies per window. Input records with null keys are ignored in general. When a record key is received for the first time for a given window, the initializer is called (and called before the adder). When using session windows: the session merger is called whenever two sessions are being merged. Several variants of count exist, see Javadocs for details. Input records with null keys or values are ignored. Input records with null keys are ignored. Records with null values are not ignored but interpreted as “tombstones” for the corresponding key, which indicate the deletion of the key from the table. The windowed count turns a KGroupedStream<K, V> into a windowed KTable<Windowed<K>, V>. When reducing a grouped stream, you must provide an “adder” reducer (e.g., aggValue + curValue). When reducing a grouped table, you must additionally provide a “subtractor” reducer (e.g., aggValue - oldValue). Several variants of reduce exist, see Javadocs for details. When a record key is received for the first time, then the value of that record is used as the initial aggregate value. When a record key is received for the first time, then the value of that record is used as the initial aggregate value. Note that, in contrast to KGroupedStream, over time this initialization step may happen more than once for a key as a result of having received input tombstone records for that key (see below). When a tombstone record – i.e. a record with a null value – is received for a key (e.g., DELETE), then only the subtractor is called. Note that, whenever the subtractor returns a null value itself, then the corresponding key is removed from the resulting KTable. If that happens, any next input record for that key will re-initialize its aggregate value. The windowed reduce turns a KGroupedStream<K, V> into a windowed KTable<Windowed<K>, V>. The windowed reduce behaves similar to the rolling reduce described above. The additional twist is that the behavior applies per window. When a record key is received for the first time for a given window, then the value of that record is used as the initial aggregate value. Example of semantics for stream aggregations: A KGroupedStream → KTable example is shown below. The streams and the table are initially empty. Bold font is used in the column for “KTable aggregated” to highlight changed state. An entry such as (hello, 1) denotes a record with key hello and value 1. To improve the readability of the semantics table you can assume that all records are processed in timestamp order. Impact of record caches: For illustration purposes, the column “KTable aggregated” below shows the table’s state changes over time in a very granular way. In practice, you would observe state changes in such a granular way only when record caches are disabled (default: enabled). When record caches are enabled, what might happen for example is that the output results of the rows with timestamps 4 and 5 would be compacted, and there would only be a single state update for the key kafka in the KTable (here: from (kafka, 1) directly to (kafka, 3). Typically, you should only disable record caches for testing or debugging purposes – under normal circumstances it is better to leave record caches enabled. Example of semantics for table aggregations: A KGroupedTable → KTable example is shown below. The tables are initially empty. Bold font is used in the column for “KTable aggregated” to highlight changed state. An entry such as (hello, 1) denotes a record with key hello and value 1. To improve the readability of the semantics table you can assume that all records are processed in timestamp order. // in the subsequent aggregation. Impact of record caches: For illustration purposes, the column “KTable aggregated” below shows the table’s state changes over time in a very granular way. In practice, you would observe state changes in such a granular way only when record caches are disabled (default: enabled). When record caches are enabled, what might happen for example is that the output results of the rows with timestamps 4 and 5 would be compacted, and there would only be a single state update for the key kafka in the KTable (here: from (kafka 1) directly to (kafka, 3). Typically, you should only disable record caches for testing or debugging purposes – under normal circumstances it is better to leave record caches enabled. Streams and tables can also be joined. Many stream processing applications in practice are coded as streaming joins. For example, applications backing an online shop might need to access multiple, updating database tables (e.g. sales prices, inventory, customer information) in order to enrich a new data record (e.g. customer transaction) with context information. That is, scenarios where you need to perform table lookups at very large scale and with a low processing latency. Here, a popular pattern is to make the information in the databases available in Kafka through so-called change data capture in combination with Kafka’s Connect API, and then implementing applications that leverage the Streams API to perform very fast and efficient local joins of such tables and streams, rather than requiring the application to make a query to a remote database over the network for each record. In this example, the KTable concept in Kafka Streams would enable you to track the latest state (e.g., snapshot) of each table in a local state store, thus greatly reducing the processing latency as well as reducing the load of the remote databases when doing such streaming joins. The following join operations are supported, see also the diagram in the overview section of Stateful Transformations. Depending on the operands, joins are either windowed joins or non-windowed joins. Each case is explained in more detail in the subsequent sections. Input data must be co-partitioned when joining. This ensures that input records with the same key, from both sides of the join, are delivered to the same stream task during processing. It is the responsibility of the user to ensure data co-partitioning when joining. If possible, consider using global tables (GlobalKTable) for joining because they do not require data co-partitioning. The input topics of the join (left side and right side) must have the same number of partitions. All applications that write to the input topics must have the same partitioning strategy so that records with the same key are delivered to same partition number. In other words, the keyspace of the input data must be distributed across partitions in the same manner. This means that, for example, applications that use Kafka’s Java Producer API must use the same partitioner (cf. the producer setting "partitioner.class" aka ProducerConfig.PARTITIONER_CLASS_CONFIG), and applications that use the Kafka’s Streams API must use the same StreamPartitioner for operations such as KStream#to(). The good news is that, if you happen to use the default partitioner-related settings across all applications, you do not need to worry about the partitioning strategy. Why is data co-partitioning required? Because KStream-KStream, KTable-KTable, and KStream-KTable joins are performed based on the keys of records (e.g., leftRecord.key == rightRecord.key), it is required that the input streams/tables of a join are co-partitioned by key. The only exception are KStream-GlobalKTable joins. Here, co-partitioning is it not required because all partitions of the GlobalKTable‘s underlying changelog stream are made available to each KafkaStreams instance, i.e. each instance has a full copy of the changelog stream. Further, a KeyValueMapper allows for non-key based joins from the KStream to the GlobalKTable. Kafka Streams partly verifies the co-partitioning requirement: During the partition assignment step, i.e. at runtime, Kafka Streams verifies whether the number of partitions for both sides of a join are the same. If they are not, a TopologyBuilderException (runtime exception) is being thrown. Note that Kafka Streams cannot verify whether the partitioning strategy matches between the input streams/tables of a join – it is up to the user to ensure that this is the case. Ensuring data co-partitioning: If the inputs of a join are not co-partitioned yet, you must ensure this manually. You may follow a procedure such as outlined below. Identify the input KStream/KTable in the join whose underlying Kafka topic has the smaller number of partitions. Let’s call this stream/table “SMALLER”, and the other side of the join “LARGER”. To learn about the number of partitions of a Kafka topic you can use, for example, the CLI tool bin/kafka-topics with the --describe option. Pre-create a new Kafka topic for “SMALLER” that has the same number of partitions as “LARGER”. Let’s call this new topic “repartitioned-topic-for-smaller”. Typically, you’d use the CLI tool bin/kafka-topics with the --create option for this. Within your application, re-write the data of “SMALLER” into the new Kafka topic. You must ensure that, when writing the data with to or through, the same partitioner is used as for “LARGER”. If “SMALLER” is a KStream: KStream#to("repartitioned-topic-for-smaller"). If “SMALLER” is a KTable: KTable#to("repartitioned-topic-for-smaller"). Within your application, re-read the data in “repartitioned-topic-for-smaller” into a new KStream/KTable. If “SMALLER” is a KStream: KStreamBuilder#stream("repartitioned-topic-for-smaller"). If “SMALLER” is a KTable: KStreamBuilder#table("repartitioned-topic-for-smaller"). Within your application, perform the join between “LARGER” and the new stream/table. KStream-KStream joins are always windowed joins, because otherwise the size of the internal state store used to perform the join – e.g., a sliding window or “buffer” – would grow indefinitely. For stream-stream joins it’s important to highlight that a new input record on one side will produce a join output for each matching record on the other side, and there can be multiple such matching records in a given join window (cf. the row with timestamp 15 in the join semantics table below, for example). Data must be co-partitioned: The input data for both sides must be co-partitioned. Causes data re-partitioning of a stream if and only if the stream was marked for re-partitioning (if both are marked, both are re-partitioned). Several variants of join exists, see the Javadocs for details. The join is key-based, i.e. with the join predicate leftRecord.key == rightRecord.key, and window-based, i.e. two input records are joined if and only if their timestamps are “close” to each other as defined by the user-supplied JoinWindows, i.e. the window defines an additional join predicate over the record timestamps. The join will be triggered under the conditions listed below whenever new input is received. When it is triggered, the user-supplied ValueJoiner will be called to produce join output records. Input records with a null key or a null value are ignored and do not trigger the join. See the semantics overview at the bottom of this section for a detailed description. Several variants of leftJoin exists, see the Javadocs for details. For each input record on the left side that does not have any match on the right side, the ValueJoiner will be called with ValueJoiner#apply(leftRecord.value, null); this explains the row with timestamp=3 in the table below, which lists [A, null] in the LEFT JOIN column. Several variants of outerJoin exists, see the Javadocs for details. For each input record on one side that does not have any match on the other side, the ValueJoiner will be called with ValueJoiner#apply(leftRecord.value, null) or ValueJoiner#apply(null, rightRecord.value), respectively; this explains the row with timestamp=3 in the table below, which lists [A, null] in the OUTER JOIN column (unlike LEFT JOIN, [null, x] is possible, too, but no such example is shown in the table). Semantics of stream-stream joins: The semantics of the various stream-stream join variants are explained below. To improve the readability of the table, assume that (1) all records have the same key (and thus the key in the table is omitted), (2) all records belong to a single join window, and (3) all records are processed in timestamp order. The columns INNER JOIN, LEFT JOIN, and OUTER JOIN denote what is passed as arguments to the user-supplied ValueJoiner for the join, leftJoin, and outerJoin methods, respectively, whenever a new input record is received on either side of the join. An empty table cell denotes that the ValueJoiner is not called at all. KTable-KTable joins are always non-windowed joins. They are designed to be consistent with their counterparts in relational databases. The changelog streams of both KTables are materialized into local state stores to represent the latest snapshot of their table duals. The join result is a new KTable that represents the changelog stream of the join operation. The join is key-based, i.e. with the join predicate leftRecord.key == rightRecord.key. Input records with a null key are ignored and do not trigger the join. Input records with a null value are interpreted as tombstones for the corresponding key, which indicate the deletion of the key from the table. Tombstones do not trigger the join. When an input tombstone is received, then an output tombstone is forwarded directly to the join result KTable if required (i.e. only if the corresponding key actually exists already in the join result KTable). For each input record on one side that does not have any match on the other side, the ValueJoiner will be called with ValueJoiner#apply(leftRecord.value, null) or ValueJoiner#apply(null, rightRecord.value), respectively; this explains the rows with timestamp=3 and timestamp=7 in the table below, which list [A, null] and [null, b], respectively, in the OUTER JOIN column. Semantics of table-table joins: The semantics of the various table-table join variants are explained below. To improve the readability of the table, you can assume that (1) all records have the same key (and thus the key in the table is omitted) and that (2) all records are processed in timestamp order. The columns INNER JOIN, LEFT JOIN, and OUTER JOIN denote what is passed as arguments to the user-supplied ValueJoiner for the join, leftJoin, and outerJoin methods, respectively, whenever a new input record is received on either side of the join. An empty table cell denotes that the ValueJoiner is not called at all. KStream-KTable joins are always non-windowed joins. They allow you to perform table lookups against a KTable (changelog stream) upon receiving a new record from the KStream (record stream). An example use case would be to enrich a stream of user activities (KStream) with the latest user profile information (KTable). Causes data re-partitioning of the stream if and only if the stream was marked for re-partitioning. Only input records for the left side (stream) trigger the join. Input records for the right side (table) update only the internal right-side join state. Input records for the stream with a null key or a null value are ignored and do not trigger the join. Input records for the table with a null value are interpreted as tombstones for the corresponding key, which indicate the deletion of the key from the table. Tombstones do not trigger the join. Semantics of stream-table joins: The semantics of the various stream-table join variants are explained below. To improve the readability of the table we assume that (1) all records have the same key (and thus we omit the key in the table) and that (2) all records are processed in timestamp order. The columns INNER JOIN and LEFT JOIN denote what is passed as arguments to the user-supplied ValueJoiner for the join and leftJoin methods, respectively, whenever a new input record is received on either side of the join. An empty table cell denotes that the ValueJoiner is not called at all. KStream-GlobalKTable joins are always non-windowed joins. They allow you to perform table lookups against a GlobalKTable (entire changelog stream) upon receiving a new record from the KStream (record stream). An example use case would be “star queries” or “star joins”, where you would enrich a stream of user activities (KStream) with the latest user profile information (GlobalKTable) and further context information (further GlobalKTables). They do not require data co-partitioning. They allow for joining against foreign keys; i.e., you can lookup data in the table not just by the keys of records in the stream, but also by data in the record values. They make many use cases feasible where you must work on heavily skewed data and thus suffer from hot partitions. They are often more efficient than their partitioned KTable counterpart when you need to perform multiple joins in succession. The GlobalKTable is fully bootstrapped upon (re)start of a KafkaStreams instance, which means the table is fully populated with all the data in the underlying topic that is available at the time of the startup. The actual data processing begins only once the bootstrapping has completed. The join is indirectly key-based, i.e. with the join predicate KeyValueMapper#apply(leftRecord.key, leftRecord.value) == rightRecord.key. Input records for the table with a null value are interpreted as tombstones, which indicate the deletion of a record key from the table. Tombstones do not trigger the join. For each input record on the left side that does not have any match on the right side, the ValueJoiner will be called with ValueJoiner#apply(leftRecord.value, null). 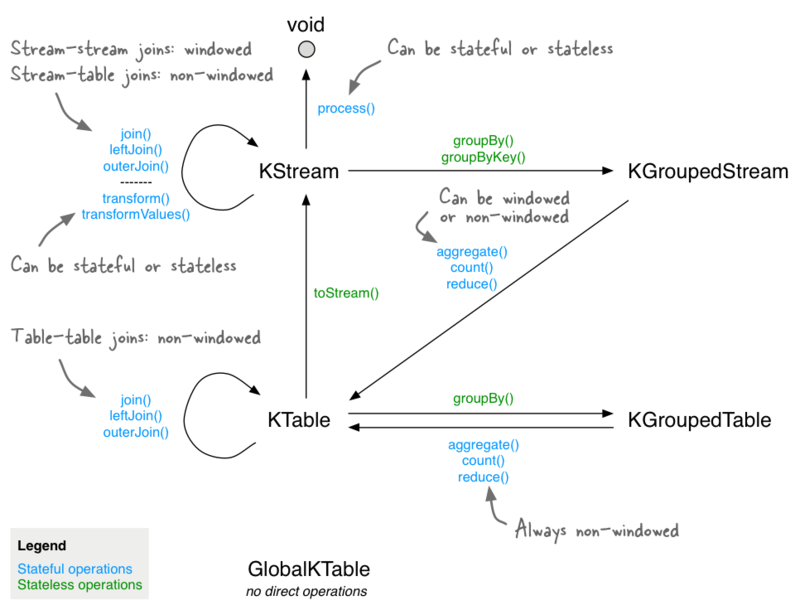 Semantics of stream-table joins: The join semantics are identical to KStream-KTable joins. The only difference is that, for KStream-GlobalKTable joins, the left input record is first “mapped” with a user-supplied KeyValueMapper into the table’s keyspace prior to the table lookup. A related operation is grouping, which groups all records that have the same key to ensure that data is properly partitioned (“keyed”) for subsequent operations. 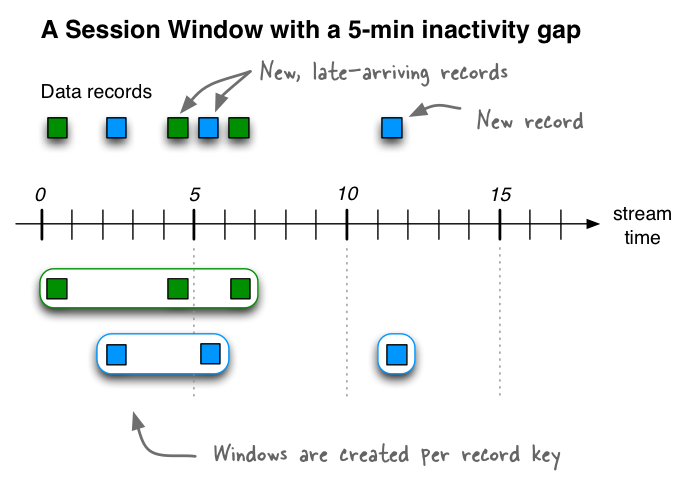 Once grouped, windowing allows you to further sub-group the records of a key. For example, in join operations, a windowing state store is used to store all the records received so far within the defined window boundary. In aggregating operations, a windowing state store is used to store the latest aggregation results per window. Old records in the state store are purged after the specified window retention period. Kafka Streams guarantees to keep a window for at least this specified time; the default value is one day and can be changed via Windows#until() and SessionWindows#until(). 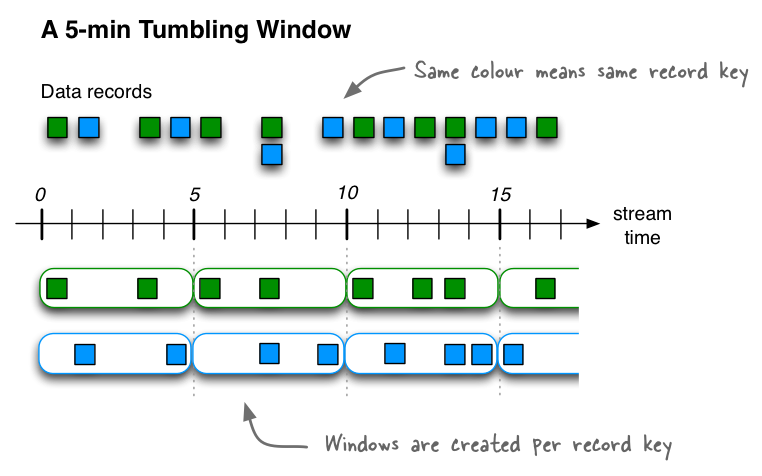 This diagram shows windowing a stream of data records with tumbling windows. Windows do not overlap because, by definition, the advance interval is identical to the window size. In this diagram the time numbers represent minutes; e.g. t=5 means “at the five-minute mark”. In reality, the unit of time in Kafka Streams is milliseconds, which means the time numbers would need to be multiplied with 60 * 1,000 to convert from minutes to milliseconds (e.g. t=5 would become t=300,000). // advance interval of 5 minutes). // Key (String) is user id, value (Avro record) is the page view event for that user. // Such a data stream is often called a "clickstream". Hopping time windows are windows based on time intervals. They model fixed-sized, (possibly) overlapping windows. A hopping window is defined by two properties: the window’s size and its advance interval (aka “hop”). The advance interval specifies by how much a window moves forward relative to the previous one. For example, you can configure a hopping window with a size 5 minutes and an advance interval of 1 minute. Since hopping windows can overlap – and in general they do – a data record may belong to more than one such window. 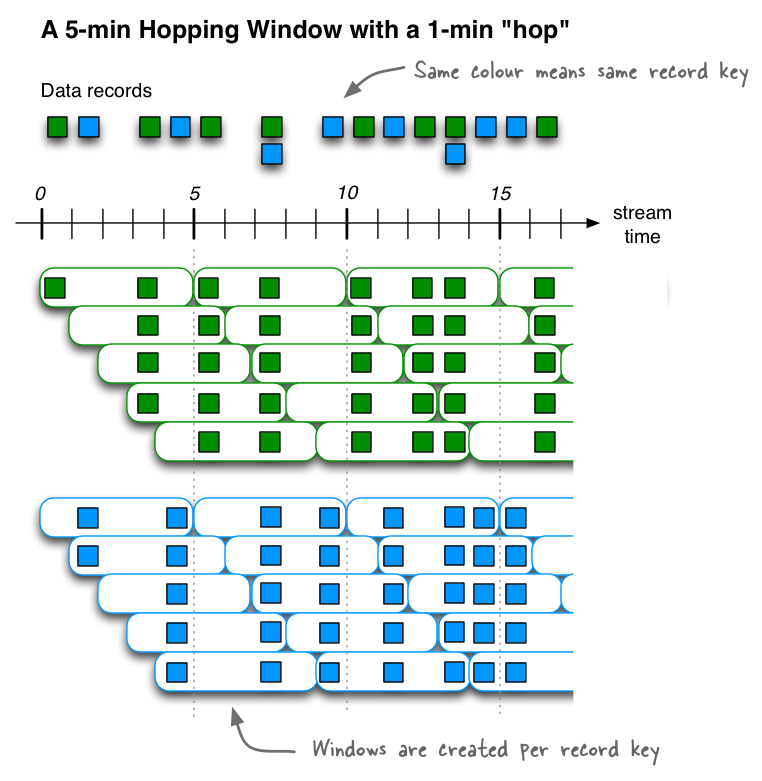 This diagram shows windowing a stream of data records with hopping windows. In this diagram the time numbers represent minutes; e.g. t=5 means “at the five-minute mark”. In reality, the unit of time in Kafka Streams is milliseconds, which means the time numbers would need to be multiplied with 60 * 1,000 to convert from minutes to milliseconds (e.g. t=5 would become t=300,000). Unlike non-windowed aggregates that we have seen previously, windowed aggregates return a windowed KTable whose keys type is Windowed<K>. This is to differentiate aggregate values with the same key from different windows. The corresponding window instance and the embedded key can be retrieved as Windowed#window() and Windowed#key(), respectively. Sliding windows are actually quite different from hopping and tumbling windows. In Kafka Streams, sliding windows are used only for join operations, and can be specified through the JoinWindows class. A sliding window models a fixed-size window that slides continuously over the time axis; here, two data records are said to be included in the same window if (in the case of symmetric windows) the difference of their timestamps is within the window size. Thus, sliding windows are not aligned to the epoch, but to the data record timestamps. In contrast to hopping and tumbling windows, the lower and upper window time interval bounds of sliding windows are both inclusive. Session windows are used to aggregate key-based events into so-called sessions, the process of which is referred to as sessionization. Sessions represent a period of activity separated by a defined gap of inactivity (or “idleness”). Any events processed that fall within the inactivity gap of any existing sessions are merged into the existing sessions. If an event falls outside of the session gap, then a new session will be created. The prime area of application for session windows is user behavior analysis. Session-based analyses can range from simple metrics (e.g. count of user visits on a news website or social platform) to more complex metrics (e.g. customer conversion funnel and event flows). 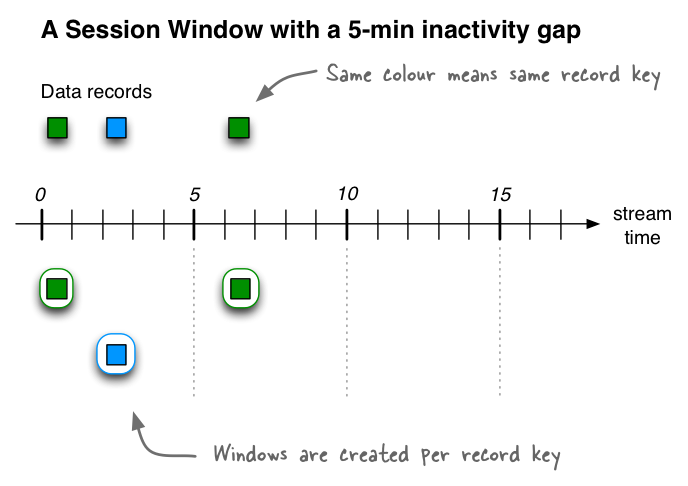 // A session window with an inactivity gap of 5 minutes. Given the previous session window example, here’s what would happen on an input stream of six records. When the first three records arrive (upper part of in the diagram below), we’d have three sessions (see lower part) after having processed those records: two for the green record key, with one session starting and ending at the 0-minute mark (only due to the illustration it looks as if the session goes from 0 to 1), and another starting and ending at the 6-minute mark; and one session for the blue record key, starting and ending at the 2-minute mark. Detected sessions after having received three input records: two records for the green record key at t=0 and t=6, and one record for the blue record key at t=2. In this diagram the time numbers represent minutes; e.g. t=5 means “at the five-minute mark”. In reality, the unit of time in Kafka Streams is milliseconds, which means the time numbers would need to be multiplied with 60 * 1,000 to convert from minutes to milliseconds (e.g. t=5 would become t=300,000). If we then receive three additional records (including two late-arriving records), what would happen is that the two existing sessions for the green record key will be merged into a single session starting at time 0 and ending at time 6, consisting of a total of three records. The existing session for the blue record key will be extended to end at time 5, consisting of a total of two records. And, finally, there will be a new session for the blue key starting and ending at time 11. Detected sessions after having received six input records. Note the two late-arriving data records at t=4 (green) and t=5 (blue), which lead to a merge of sessions and an extension of a session, respectively. Counting example using session windows: Let’s say we want to analyze reader behavior on a news website such as the New York Times, given a session definition of “As long as a person views (clicks on) another page at least once every 5 minutes (= inactivity gap), we consider this to be a single visit and thus a single, contiguous reading session of that person.” What we want to compute off of this stream of input data is the number of page views per session. Customization: You need to implement special, customized logic that is not or not yet available in the DSL. Combining ease-of-use with full flexibility where it’s needed: Even though you generally prefer to use the expressiveness of the DSL, there are certain steps in your processing that require more flexibility and tinkering than the DSL provides. For example, only the Processor API provides access to a record’s metadata such as its topic, partition, and offset information. However, you don’t want to switch completely to the Processor API just because of that. Migrating from other tools: You are migrating from other stream processing technologies that provide an imperative API, and migrating some of your legacy code to the Processor API was faster and/or easier than to migrate completely to the DSL right away. This is essentially equivalent to adding the Processor via TopologyBuilder#addProcessor() to your processor topology. An example is available in the javadocs. Each input record is transformed into zero, one, or more output records (similar to the stateless flatMap). The Transformer must return null for zero output. You can modify the record’s key and value, including their types. Marks the stream for data re-partitioning: Applying a grouping or a join after transform will result in re-partitioning of the records. If possible use transformValues instead, which will not cause data re-partitioning. transform is essentially equivalent to adding the Transformer via TopologyBuilder#addProcessor() to your processor topology. An example is available in the javadocs. Also, a full end-to-end demo is available at MixAndMatchLambdaIntegrationTest. Each input record is transformed into exactly one output record (zero output records or multiple output records are not possible). The ValueTransformer may return null as the new value for a record. transformValues is preferable to transform because it will not cause data re-partitioning. transformValues is essentially equivalent to adding the ValueTransformer via TopologyBuilder#addProcessor() to your processor topology. The following example shows how to leverage, via the KStream#process() method, a custom Processor that sends an email notification whenever a page view count reaches a predefined threshold. // Here you would perform any additional initializations such as setting up an email client. // Here you would format and send the alert email. // (because the class implements `Processor<PageId, Long>`). // Stays empty. In this use case there would be no need for a periodical action of this processor. // Any code for clean up would go here. This processor instance will not be used again after this call. Even though we do not demonstrate it in this example, a stream processor can access any available state stores by calling ProcessorContext#getStateStore(). Only such state stores are available that (1) have been named in the corresponding KStream#process() method call (note that this is a different method than Processor#process()), plus (2) all global stores. Note that global stores do not need to be attached explicitly; however, they only allow for read-only access. Then we can leverage the PopularPageEmailAlert processor in the DSL via KStream#process. // `Processor` interface, see above. // the `Processor` interface, see above. Any streams and tables may be (continuously) written back to a Kafka topic. As we will describe in more detail below, the output data might be re-partitioned on its way to Kafka, depending on the situation. You must specify SerDes explicitly if the key and/or value types of the KStream or KTable do not match the configured default SerDes. See Data Types and Serialization for information about configuring default SerDes, available SerDes, and implementing your own custom SerDes. Several variants of to exist to e.g. specify a custom StreamPartitioner that gives you control over how output records are distributed across the partitions of the output topic. If the output topic has a different number of partitions than the stream/table. If the KStream was marked for re-partitioning. If you provide a custom StreamPartitioner to explicitly control how to distribute the output records across the partitions of the output topic. If the key of an output record is null. Several variants of through exist to e.g. specify a custom StreamPartitioner that gives you control over how output records are distributed across the partitions of the output topic. When you want to write to systems other than Kafka: Besides writing the data back to Kafka, you can also apply a custom processor as a stream sink at the end of the processing to, for example, write to external databases. First, doing so is not a recommended pattern – we strongly suggest to use the Kafka Connect API instead. However, if you do use such a sink processor, please be aware that it is now your responsibility to guarantee message delivery semantics when talking to such external systems (e.g., to retry on delivery failure or to prevent message duplication).